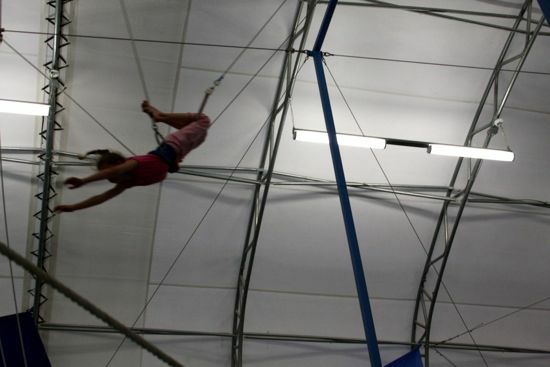 At the beginning of the summer, Caitlyn decided she was ready to check out the flying trapeze at circus class. She took three swings and declared herself ready for a full lesson. It took the full two hours of her class, but Caitlyn finally convinced herself to make the jump. She starts with her hands on the bar, then - while flying - swings her legs up to hang from her knees. Then it's back to her hands and a back tuck from the bar to the net. that daring young Caitlyn on the flying trapeze! Wow! Can't wait to see the slightly more finished product!